With more people on the move than ever before, conflicts lasting years and chronic violence on the rise in many areas, millions of children are deprived of even a basic education. From the sprawling rows of tents of the Dadaab refugee camps in eastern Kenya, to the slopes of Mount Olympus in Greece and the cramped apartments in long-time refugee settlements in Lebanon and Syria, the world’s approximately 65 million displaced people are spread far and wide. Underlying their dire circumstances and their difficult living conditions is a less visible but silently growing crisis. As conflicts become ever more protracted and chronic violence in some places becomes a permanent fact of life, more and more children enter adulthood deprived of a meaningful education. Or, as in the case of 25-year-old Salim Salamah, their learning is rudely interrupted. Salamah grew up as a child refugee in the besieged Yarmouk Palestinian refugee camp outside Damascus, Syria. Because the six-decades-old Yarmouk camp had over time become a relatively stable community, Salamah was able to pursue a law degree until the Syrian conflict forced him to become a double refugee. Children need to get to school safely and feel safe when they are there. Parents cannot be so poor they need their children to work or beg to survive. Communities need stability so they can invest in the future. With crises in many parts of the world lasting for decades and no end in sight to the causes driving mass displacement or chronic violence, these are critical challenges underlying the growing need for education in emergencies. Faced with mounting demand, leading humanitarian organizations (including the International Red Cross and Red Crescent Movement) have joined calls for more to be done to bring education to people in desperate need. Two high-profile international summits held in 2016 both produced education-related commitments. The inaugural World Humanitarian Summit held in Istanbul in May 2016, highlighted the fact that only 2 per cent of humanitarian funding is directed towards education. In response, the Education Cannot Wait fund was launched with the aim of pooling US$ 3.85billion over five years to ensure that all crisis-affected children and youth have safe, free and quality education by 2030. Then, in September, world leaders gathered for a refugee-focused Leader’s Summit pledged US$ 4.5billion in humanitarian aid to increase places for global resettlement and facilitate school enrolment, classroom construction, teacher training and streamlining refugee education programmes. For many in the Movement, there is no doubt that education is a humanitarian imperative. In other contexts outside conflict, the IFRC and National Societies are exploring new initiatives while examining what they can do to expand existing programmes. “Usually, [education] is the responsibility of governments, which is a role we don’t substitute,” says Tiziana Bonzon, migration lead at the IFRC. In the context of migration, the IFRC supports National Society efforts to facilitate access to educational institutions, provide basic education services and promote a culture of tolerance that helps children in marginalized groups feel safer and welcomed in school settings. Around the world, however, the Movement’s educational initiatives are extremely diverse and very context specific, based on local needs, the particular histories of each country and the crisis they are going through. Most Movement educational endeavours revolve around humanitarian concerns, such as instructing communities about hygiene, first aid or disaster risk reduction; explaining the importance of respecting international humanitarian law (IHL) to armed forces or armed groups; working with youth in local communities and schools to reduce the impact of violence; or vocational training to help people get back on their feet after a shock. In some cases, the education offered by Movement components is extremely specialized: medical training in hospitals run by National Societies; ICRC courses in war surgery or IHL; veterinary training for the protection of livestock in war-affected areas; partnerships with academic institutions on studies of humanitarian affairs, among others. 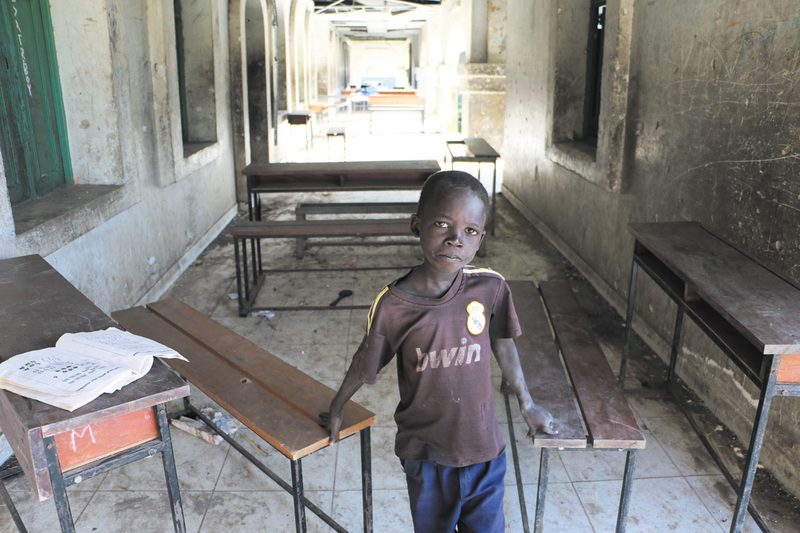 For people living with conflict or in areas of chronic violence, or who are displaced by fighting or natural disaster, the Movement generally aims to support the education offered in local schools, create safe spaces in which education can succeed or enable access to education for those who may be deprived due to lack of resources, security or societal acceptance. Andrew Connelly is a freelance journalist based in Ankara, Turkey. In areas affected by high levels of chronic violence in Latin America, for example, the ICRC works with National Societies and local authorities to promote behaviour among young people conducive to reducing armed violence. Ongoing in some 100 schools in Brazil, Colombia, Honduras and Mexico, the projects are usually linked to broader, local efforts to reduce the impact of violence, such as teaching students how to respond to violent incidents, training youth in first-aid, raising awareness of humanitarian principles and promoting safer access to healthcare. Combined, such initiatives help provide a more learning-friendly backdrop. In the state of Rio de Janeiro, Brazil, for example, schools involved in the project reported an increased ability to hire and retain teachers, improved pupil achievement and a reduction in drop-out rates. While none of this involves directly providing the kind of general education — reading, writing, maths, science, history, the arts — that many are calling for urgently, these initiatives do make a critical contribution. “One thing we already do in some contexts is work to eliminate the barriers — or the gaps in protection — that get in the way of children going to school,” says Hugo van den Eertwegh, a security management and risk adviser for the ICRC. In situations of conflict or extreme violence, the ICRC’s stance as a neutral intermediary could also play a particular role — through dialogue with armed forces, armed groups or criminal gangs — in helping to generate more respect for schools and the safety of children going to school. Meanwhile, the ICRC’s expertise on IHL allows it to call at the international level for more respect for existing international norms protecting education in situations of conflict. Meanwhile, National Societies and the IFRC are also heavily involved in efforts to fill gaps and foster greater access to education. In numerous countries, National Societies are engaging communities in the IFRC’s Youth as Agents of Behaviour Change (YABC) curriculum, which brings young people together for peer-to-peer activities — from arts and sports to first aid — that foster non-violence and non-discrimination. This can allow greater access to education among marginalized groups who might not otherwise feel entirely safe in school settings. In Madagascar, for example, the Malagasy Red Cross Society is involved in the Ampinga project, which aims to combat harassment and violence, which has led to 25 per cent absentee rates in some schools. Supported by the IFRC and run in conjunction with a community group, Ampinga offers a safe space in which students can speak about acts of violence perpetrated against them or that they themselves have committed. They also confront the fear, depression and absenteeism caused by the violence and learn ways to manage anger, de-escalate tensions and promote healthier responses to disagreement and differences. In most cases, National Societies are in the forefront of such efforts, with contributions from the ICRC, the IFRC and National Societies from elsewhere. Since 2012, for example, the Chihuahua branch of the Mexican Red Cross has worked to foster an environment in which young people have safer access to education in Ciudad Juarez, a city on the border with the United States that has extremely high rates of violence. Supported by the ICRC and in partnership with local education authorities, the project offers non-judgemental spaces for dialogue among students — and between students and teachers — about core humanitarian values and the realities of everyday life. In addition to practical guidance on how to deal more safely with violent episodes, psychosocial support is offered via in-school ‘helpers’ and activities such as art, sports, theatre and music. In some crisis situations, such as refugee camps or urban areas where migrants are settling more informally, another important approach is the creation of ‘child-friendly spaces’, which give parents some assurance of security and some basic learning, social integration or psychological support. The level of education offered — usually through an external partner — varies widely, however. While children may benefit from language, art or therapeutic activities that allow them to express themselves or cope in their new situations, few of these child-friendly spaces offer anything like a comprehensive primary education. While all these initiatives are making a difference, there is wide consensus that much more could be done through building on the Movement’s experience in developing such initiatives. But how far should Movement components go, given the scope of the tasks already at hand and the limited resources available to meet even basic physical needs? 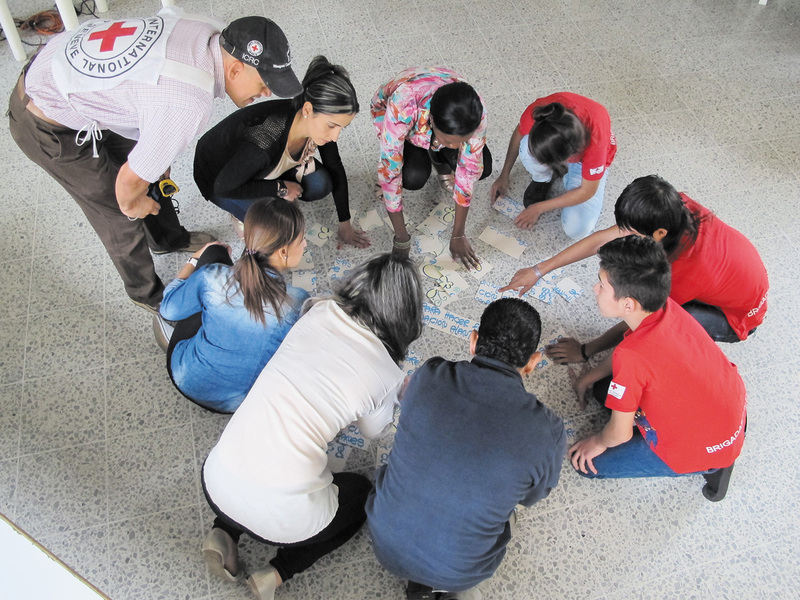 In Comuna 13 of Medellin City in Colombia, students of the Eduardo Santos Public School take part in safe behaviour training that includes a simulation exercise on planning, developing and evaluating safe responses to armed violence. The session is part of the Urban Violence project, organized to mitigate the humanitarian consequences of urban armed violence on the communities. The Movement is not alone in asking these questions. Many humanitarian organizations, large and small, are facing similar challenges. Many also report that they are finding ways to support educational efforts through the lens of their existing area of focus. The privately funded, US-based Karam Foundation, for example, works with Syrian families in southern Turkey, where Syrian children are often forced to work because their parents can’t make ends meet. At least two-thirds of the 700,000 school-age Syrian children in Turkey receive no formal education but efforts are under way to support them in temporary learning centres run by both the Turkish government and independent Syrian organizations. “We provide them with cash transfers, conditional on their children going to school, and this vastly improves attendance,” says advocacy coordinator Lilah Khoja. Given the lack of trained teachers, funding shortfalls, the geographic isolation of refugees in camps and their restrictions on travel, technology could also make an important impact. At the grass-roots level, the Techfugees social enterprise has organized Europe-wide meetings to connect the tech community’s response to refugee needs. Solutions range from distance learning via the internet to the use of apps for tackling specific subjects. For chief operating officer Josephine Goube, there is no shortage of ideas. “The challenge for these innovations is getting the humanitarian sector to embrace them and to support the infrastructure on which these solutions rely (e.g., internet, hardware),” she says. Not all the limits on what humanitarians might do is a question of resources, however. In some situations of conflict or violence, essential elements of educational curriculum — history, cultural identity, politics and economics — might be central to the tensions at hand. Use of a particular curriculum, therefore, might be perceived as running counter to the Movement’s position of neutrality. In other cases, humanitarian organizations might have to be careful about getting drawn in too closely with development goals (of which education is often a cornerstone) particularly when that agenda is aligned with political objectives that are controversial or one of the root causes of fighting. In order to find the right balance for all these challenges, the ICRC, the IFRC and National Societies say they will continue to work together to coordinate their various approaches, assign roles and offer guidance on working with external partners.